1st Place: I had predicted this event would be determined by ounces. Midway through the weigh-in, Derek Deardorff acknowledged I was right. But that all changed when Greg Mangus and Kevin Fletcher came to the scales. The team blew out the competition by weighing the 2nd heaviest sack in R & B history. It was also the 3rd most lopsided event in our short history (view Records). They caught all of their fish on black/green jigs tipped with Poor Boys' Pork Chunk trailers. Mangus tossed his popular Mango Jig while "Bubba" tossed one of his homemade jigs. Mangus' jig was 1/2 ounce while Fletcher's was 3/8 ounce. 2nd Place:Craig Chupp and Dave Miller have been on on fire! 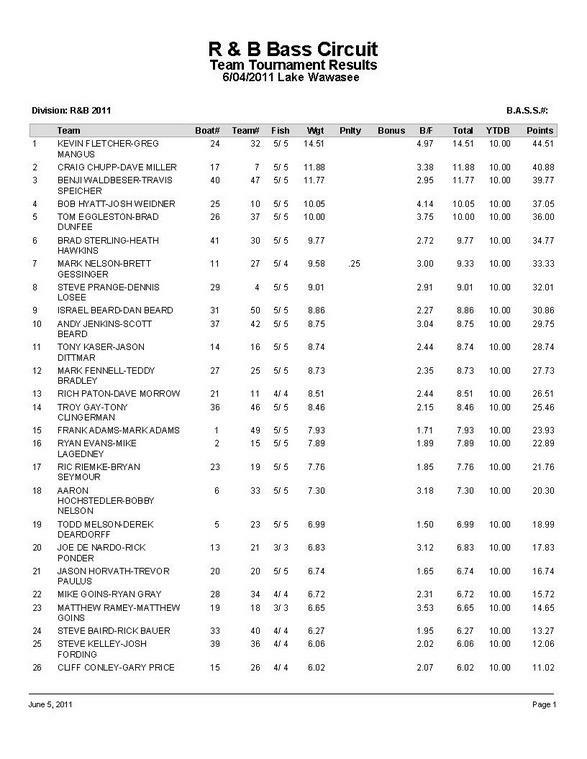 Now with 2 top 5 finishes in the first 3 events, the team is right on the heels of the leaders. They can thank a single rig for their success: the drop shot rig. 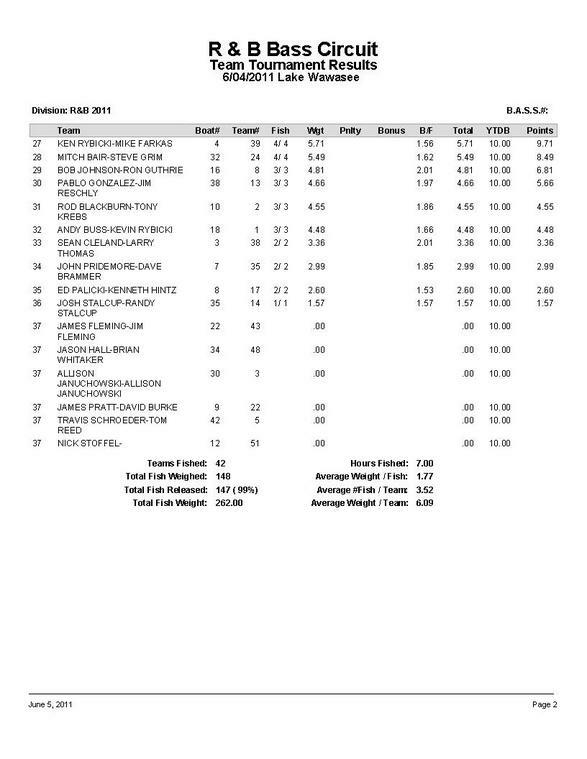 Chupp and Miller are 1 of only 6 teams to weigh a limit in each event and they have done so each time with a drop shot armed with finesse worms rigged wacky style. At the midway point of the season, it was time for someone to make a move. Since winning the first event on Lake Manitou, Teddy Bradley and Mark Fennell still clung to the lead, but that lead has now dwindled to just .33 of a point! Enter Greg Mangus and Kevin Fletcher. While Bradley was winning $10k on the Potomac River, Fennell fished with professional angler Chip Harrison on Wawasee, but even that wasn't enough to keep the team of Mangus and Fletcher from making a hard charge up the STANDINGS. Also making a serious run is the team of Craig Chupp and Dave Miller. Earning a check in 2 of the 3 events, they now stand less than 2 points out of the lead and sit in 3rd place. Quietly, Tony Kaser and Jason Dittmar have moved into 4th place and are less than 4 points out of the lead. 5th place is currently occupied by the 2010 Points Champions Aaron Hochstedler and Bobby Nelson. They are just 10 points out of the lead. Klinger Lake is next. Will one of these teams in the top 5 make a big push, or will a new team emerge as a contender? The day began well for the team as Mangus landed the Starboard Choice Marine big bass, a 4.97 pound largemouth, on their first spot at 7:15. He followed that up with additional keepers. Fletcher experimented with a Zara Spook and crankbait but those only produced rock bass, thus he concluded, "I better stick with what is working." And it was a good thing he did. The team's good fortune turned sour as they were still stuck on 4 keepers midway through the day, but worse, they had lost 4 consecutive big fish. Mangus credits Fletcher for turning their luck around. He explains, "Bubba got one and we got on a roll after that." The team caught fish nearly everywhere, but the bigger fish were tight to specific weedbeds. In all, they caught 9 keepers. The team limit weighed 14.51 pounds which won them $730 and the big fish earned them an additional $420, making their total winnings $1150. to the weeds as possible. They tricked over 20 keeper bass with this pattern. They caught their fish all over, but their best luck occurred at their first spot. It was there they landed their biggest fish, a 3.38 pounder, as well as their second biggest. They had their limit in just an hour. They then repeated the pattern on 5 different spots on Lake Wawasee and 2 additional spots on Syracuse Lake. The team's best 5 fish weighed 11.88 pounds and won them $442. 3rd Place: Contrary to the top 2 teams, newcomers Benji Waldbeser and Travis Speicher went with a horizontal presentation to claim $332. Although the team caught over 60 fish, including 15 keepers, it didn't start off so well. They began on Syracuse but put nothing in the livewell. They made a good decision: they moved to Lake Wawasee. 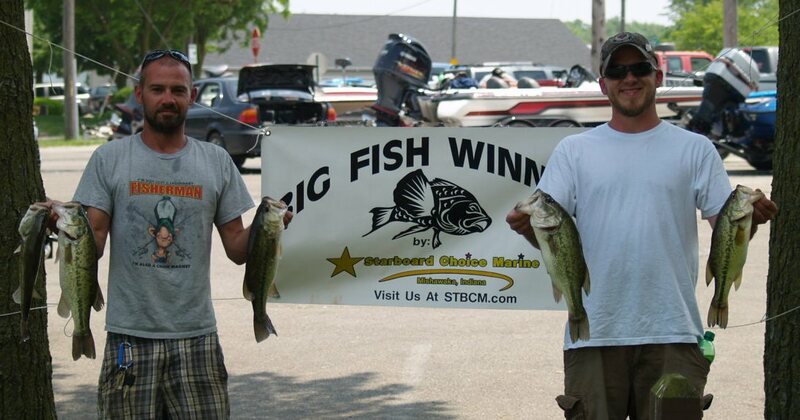 In just 15 minutes, their first spot on Wawasee produced a limit. They had 3 spots on the big lake that produced. They were all breaklines on the flats with sporadic weed patches. Their limit weighed 11.77 pounds. 4th Place:Bob Hyatt and Josh Weidner had no confidence entering the event. Hyatt admits, " I have been fishing this lake for 10 years and have never had any real success." But there is a first for everything, and in their case, they had 1 real good spot. Discovered in practice, a single channel produced 4 of their 5 keepers including the second heaviest fish of the tournament, a 4.14 pound largemouth. The big fish came from under a dock at 7:00. They had 4 keepers in the first 90 minutes of the tournament. However, the channel dried up from that point. The team scrambled and found keeper number 5 under a dock. All of their fish came from Zoom Trick Worms rigged wacky. Their limit weighed 10.05 pounds and earned them $222. 5th Place: The only top 5 team to have significant success on Syracuse lake was the team of Tom Eggleston and Brad Dunfee. They began there and caught their 3 biggest fish, including a 3.75 pound largemouth, that fell for a 4" Zoom Finesse Worm in the Watermelon Candy color. The team also caught fish on Yamamoto Senkos in the Green Pumpkin Magic color. They caught over 30 fish and 7 keepers total. 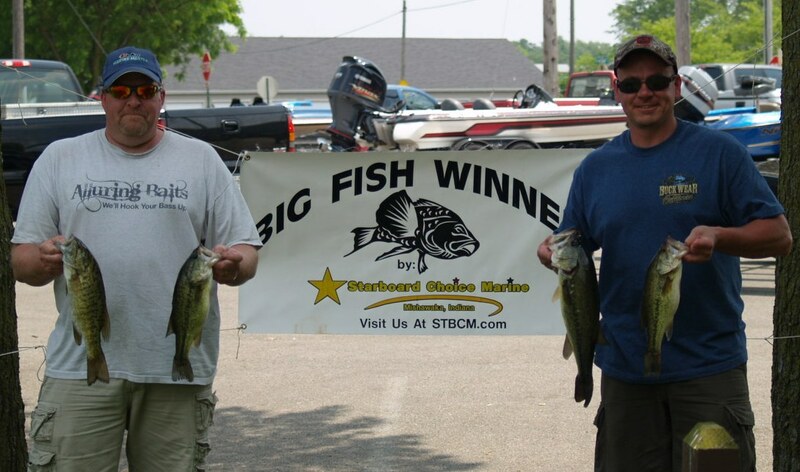 Like the 2nd place team of Chupp and Miller, they positioned their boats in 8 feet of water and tossed their baits on both the inside and outside of the weedline. The only exception was a smallmouth they caught from the end of a dock. 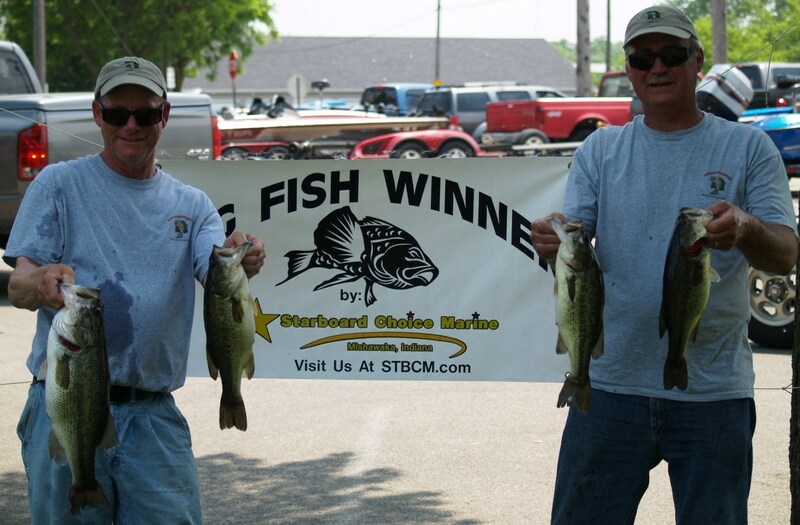 Their limit weighed 10.00 pounds and won them $158. 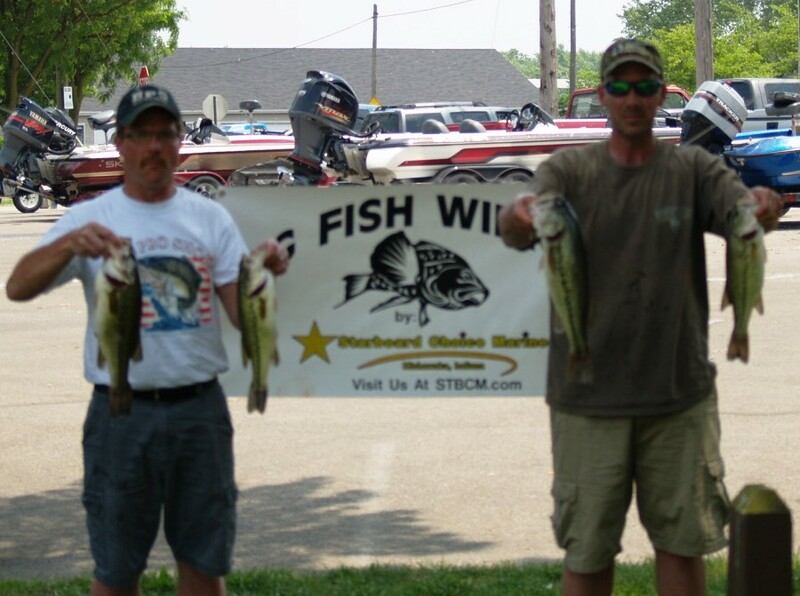 6th Place: Brad Sterling and Heath Hawkins caught a limit which weighed 9.77 pounds and won $132. 7th Place: Brett Gessinger fished with substitute Mike VanderReyden and weighed a limit of 9.58 pounds earning them $110. 8th Place: Second on the All-Time Money Winners and Top 5 Finishes lists, Steve Prange fished with substitute Bob Bruni and brought in a limit that went 9.01 pounds. They were awarded $88. D's Award: Newcomers, the Beard team, Israel and Dan, brought a limit weighing 8.86 pounds. 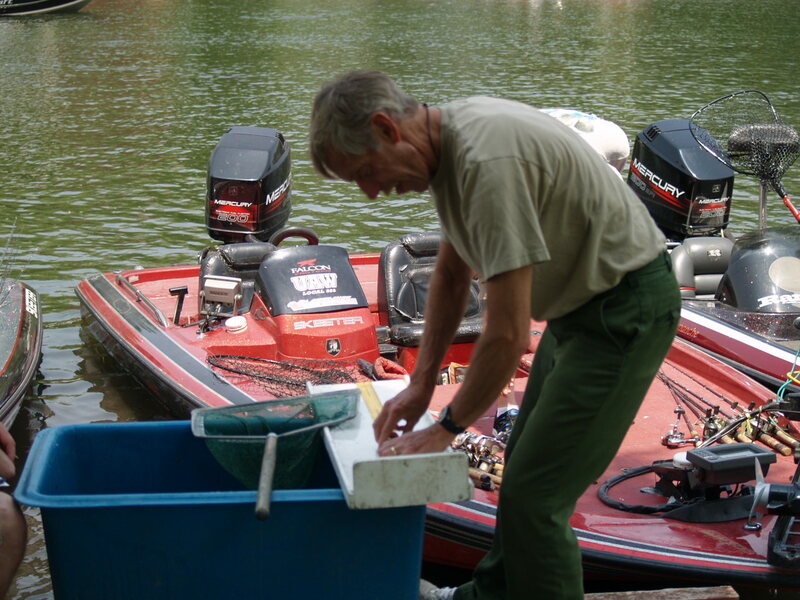 IDNR biologist Jed Pearson (left) was on hand at the weigh-in to conduct a study on the fish. 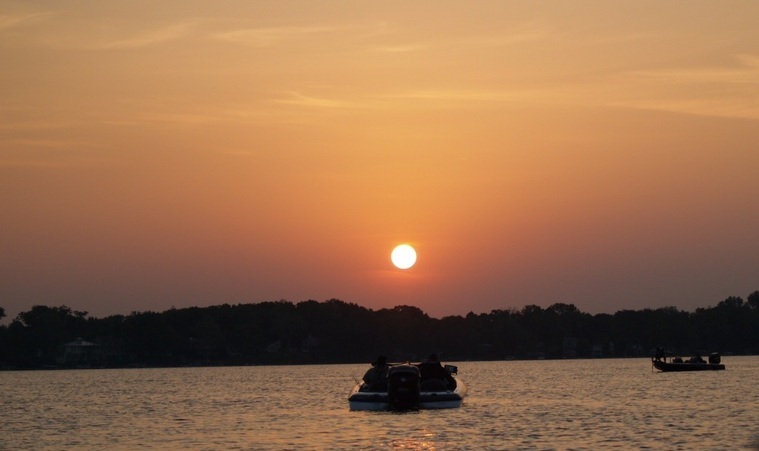 The R & B Bass Circuit supports the DNR's efforts to protect our fisheries. What is more important to our sport's future than promoting it to our most precious resource - children? 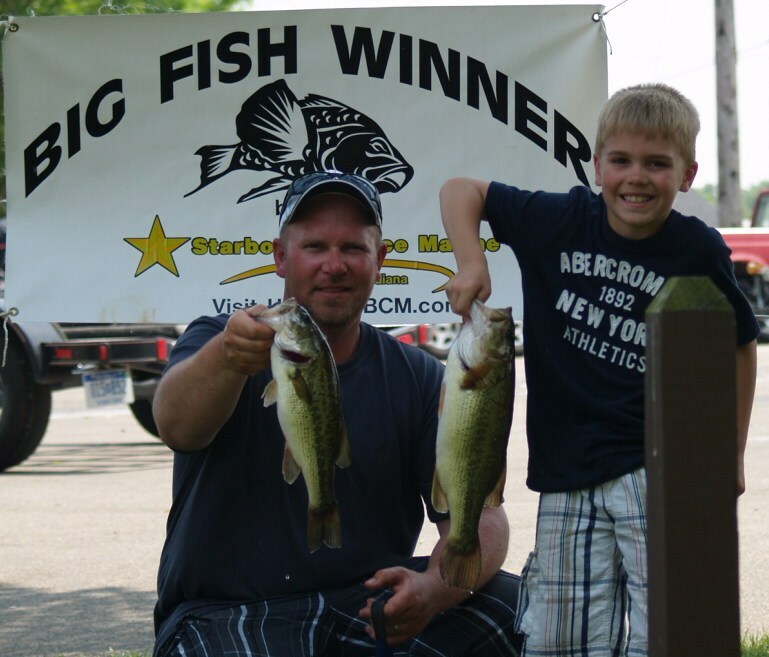 We tip our hat to all parents who take their kids fishing.